Although Facebook’s Year in Review feature aimed to bring good vibes and nostalgic feels from the previous year, it has gained ire from some netizens. It has been somewhat a tradition for Facebook to do something like this each year, supposedly to give its users a positive flashback of the year that has passed. 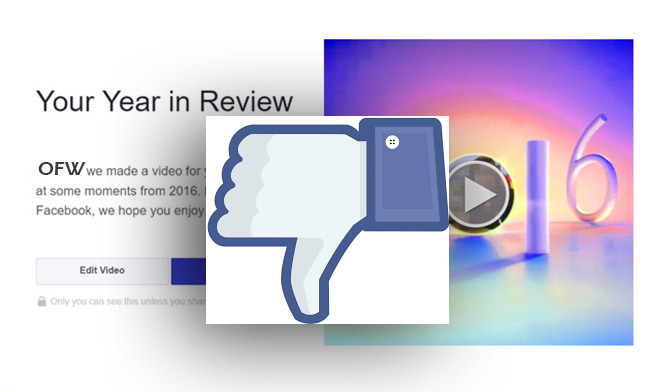 But each year, it also gains negative feedback. 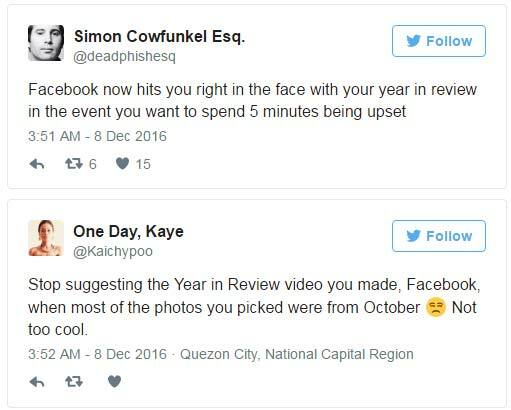 For this year’s new feature, netizens expressed their disappointment through other social media platforms, like Twitter. One netizen was disappointed because the selected pictures were from not happy moments, and forcibly made him relieve it again. Since the feature or app uses artificial intelligence, it did not really consider the kind of photos and posts selected. Facebook might have dismissed the fact that not all posted materials were from happy moments. It also became a social-media-platform-like-journal where users also post not-so-good memories. Maybe next year, Facebook would figure it out to fix the algorithm and prepare for Christmas season.